After a few months of planning, it was one year ago this week that Lisa Petrilli and I hosted the inaugural #LeadershipChat on Twitter. What a wild ride it has been! We’ve had very lively discussions about male and female roles, courage, work/life balance, loyalty, fear, promotions, lessons from the military…and we’ve enjoyed the contributions of stellar guest hosts and authors like Stephen Denny, Guy Kawasaki, Ann Handley, Steve Farber, and many others. 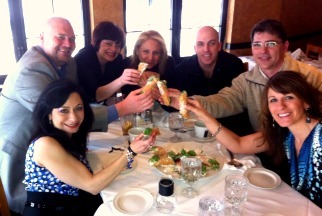 For Lisa and me, the most rewarding aspect of LeadershipChat has been the community that gathers each Tuesday night; it was our vision to create a climate similar to a Tuscan dinner table, where friends would gather for friendly discussions over wine and good food (we do sometimes open up the chat with pictures of cannoli just to gain a virtual bit of dessert atmosphere!) What has come of it all has been a bunch of real-life friendships, meetings, and collaborations – and that’s just the point. LeadershipChat on Tuesday nights is an introduction to community. What has been the most rewarding aspect for you? It only seems right, on this first anniversary, to pass the microphone to our valued friends and give you the opportunity to talk about how you’ve benefited from the LeadershipChat community – and how you’d like to grow even more in the year ahead. So, here’s what we’re asking for this week. Instead of focusing on prep blog posts that Lisa and I write, we’re inviting YOU to write a post (could be on your blog, or Facebook, or Google+ – wherever. Even in the comments below if you’re not a blogger!) expressing what you’re learned and enjoyed from LC this past year, and what you’d like to discuss in the coming year. This is your chance to tell others – and us – why LeadershipChat has value to you! We’ll link to your posts on the LeadershipChat.net site, and your thoughts will be the substance of the our conversation on Tuesday, October 11th. Please write your thoughts right now – while you’re thinking about it – and forward the link to Steve (steve at connectionagent dot com) so it will be included on the site for all to see. Finally, a big THANK YOU to all who have made this community such an encouraging success. In twelve months, we’ve made a good start together. What will the next year of sharing leadership-life bring? Let’s talk about it this Tuesday night at 8 pm ET!